Well, at least some times. Let me explain. Before I left Joplin I had mapped out a route to Laurence, Kansas where I was visiting a friend. The idea was to head straight west out of Joplin into Kansas where I would head north on highway 59. I have no idea what possessed me or why I changed my mind as I was already sitting in the truck and was ready to go. I just said: “I would like to spend a little more time in Missouri.” So instead of heading west, I went 60 miles north and then west on hwy 54 towards Fort Scott, Kansas. 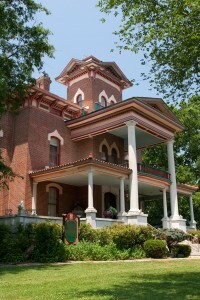 grand Victorian house. If I hadn’t already told my friend that I was coming that day (I had originally planned on being there by Memorial Day) I would have spent the rest of the day exploring Fort Scott. Hopefully, there will be a next time. You just never know what happens when you don’t stick with your plans. 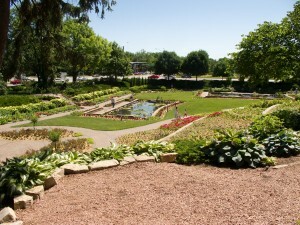 I am skipping over my visit at my friend’s place, the beautiful Flint Hill area and the rest of my stay in Kansas for the time being. About 14 years ago I spent the night in Lincoln, Nebraska. I was on a business trip driving a big van from Los Angeles to Chicago. You can tell I like to drive. I remember that I liked Lincoln, I didn’t really know why, it was one of those feeling you get when you enter a town. Now that I was back in Nebraska I wanted to check out the place more closely. I didn’t recognize anything and I didn’t have this immediate, “I really like this place” feeling either. Lincoln has grown by leaps and bounds since I visited last (1997 pop. 211,000 / 2010 – 258,000). I would call it a big small city, State capital and home of the University of Nebraska. I spent the morning hours driving around town and I liked what I saw. 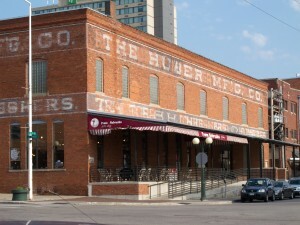 The old manufacturing buildings of the Haymarket had been converted to shops, restaurants and bars. 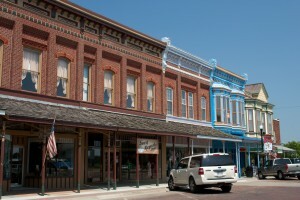 The commercial main streets were busy, but the residential neighborhoods were nice and quiet. Several parks and tree lined streets. People, mainly students, were biking everywhere, a rare sight in a large American city. It is also a walkable city, to some extend. Would I move here, I don’t know. I saw a sign for a 750 sq. ft. one bedroom apartment for $425, don’t know what the wages are like, but you can’t even get a garage parking spot for that kind of money in New York City. Lincoln has a variety of ethnic grocery stores, thanks to a diverse population, a big plus. However, fresh fish is hard to get in the middle of the country. I had dinner at the Capital City Grill and I ordered tuna, again. This time it was prepared the way it should be, but I could tell the fish had been frozen. There is just nothing better than nice fresh fish. I can’t wait to go to one of my favorite seafood restaurants in NYC, Ocean Grill, and order some crab cakes. truck when I noticed that one of the turning signals on the camper wasn’t working. It was a wiring problem and a broken bulb. It took me a bit to fix both. The signal works, but I still get a fault message in the truck, not good. Of course when it rains it pours. My inflator for the airbags, additional support for the rear suspension, did not work. It worked just fine yesterday. I can’t really drive safely with a heavy load (last weigh-in 11,000 lbs.!!!) without inflated airbags. Fortunately, a fellow camper had a compressor and inflated the bags. At this point it was three o’clock and my mood was not so rosy any more. Bare with me, I am getting to the point. Once again, I had picked a route before all this happened, but guess what, I didn’t stick with it. Since I left Nevada, I have gotten more comfortable with camping outside of regular campgrounds, i.e. parking lots or streets; the big plus: no charge, the disadvantage: no hook-ups. But with increasing temperatures I am less dependent on electricity since my solar panel charges my batteries. I just have to find a place to dump gray and black water every couple of days. As I was driving along, I started to fade, four o’clock energy lull. All I was thinking of was asking a farmer if I could stay on his land for the night. Just north of Prague, really, was a sign for a recreational area at a lake, I missed the first turn off, put managed to pull into the second one. To my delight it was a very small campground, only 8 or 9 sites, no hook-ups, a beautiful quiet setting and NO charge. There are only few campgrounds where you can stay for free, some even with hook-ups. It might be difficult for you city rats to get excited about campgrounds and hook-ups, but if you have been on the road for as long as I have (today 15 months! ), this is gold. There is only one other guy here with his truck and boat, should be a quiet night at the Czechland Lake. Thank you Mother Road! I received this e-mail today from Joplin and I would like to pass it on to everyone. The AmeriCorps groups here currently need more volunteers to help us with debris removal, home deconstruction, data entry, call center support, and warehouse support. If you are able to volunteer again, or come for the first time we would greatly appreciate it. Please contact the volunteer hotline if you have: heavy machinery, want to schedule a group, or want to volunteer as an individual. The number is available from 9am-5pm. Volunteer hotline is: 417-625-3543. Walk-ins are always welcomed just go to the MSSU football field to check in.